We had a great turnout for the first weekend of our Red Wine and Chocolate Tour. Thanks to everyone who journeyed to the Olympic Peninsula to enjoy delicious combinations of locally made chocolate and Washington State Wine. Take advantage of the upcoming long weekend and journey to the Olympic Peninsula for the Red Wine and Chocolate Tour. If you were unable to make it to Port Townsend, Sequim, or Port Angeles wineries and cideries this past weekend, you’ll have another opportunity this weekend. 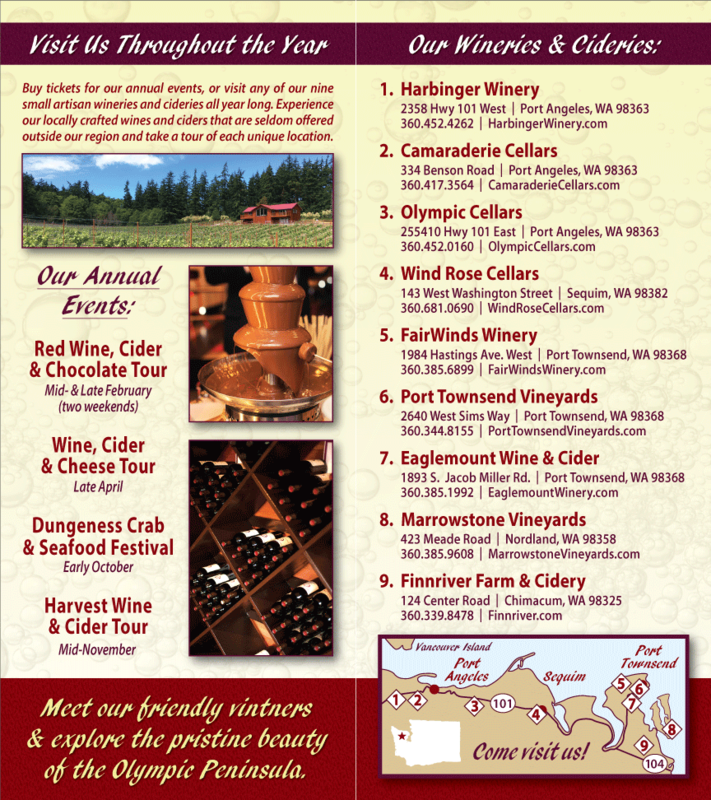 The Red Wine and Chocolate Tour of Olympic Peninsula wineries continues February 18-20, 2012. Spend a couple of nights in a romantic Port Townsend Bed and Breakfast. Rent a cozy cottage in Sequim. Book a room overlooking the water in Port Angeles. Allow yourself plenty of time to visit the eight Washington Wineries and Cideries participating in the Red Wine and Chocolate Tour. If you visit each one, you’ll be eligible to win an elegant gift basket. Take advantage of the coming long weekend. Spend your time sipping wine, savoring chocolate, and immersing yourself in the beauty of the Olympic Peninsula. Visit Dungeness Spit. Walk the trails of Fort Warden. Ride your bikes along a stretch of the Olympic Discovery Trail. Visit a beautiful farm in Chimacum. Please see our Red Wine and Chocolate Tour for additional information, and plan you weekend getaway now.